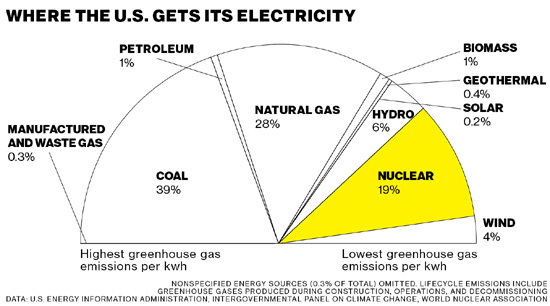 What hilled America's climate-saving nuclear renaissance? The road to the Alvin W. Vogtle Electric Generating Plant winds through Georgia pines, past the massive International Paper mill where many trees meet their end, and on toward the Savannah River, which forms the border with South Carolina. A couple of miles out, the 55-story steel-and-cement cooling towers loom over the tree line. Cottony white vapor rises from the towers in what one hopes is a friendly, nonradioactive greeting from the nuclear facility. Less friendly is the white security pickup with a yellow roof flasher that materializes when I pull my rental car to the side of River Road to take in the view. Provisionally satisfied I'm not a terrorist, the guard lets me head to the military-style entry station, where another security man with a Glock on his hip points to a glassed-in rendezvous point. Credentials are checked, and introductions are made to plant staff. They're proud of the work they do, but on high alert against sabotage and bad publicity. In rural Burke County, his namesake plant is regarded with awe, not least because it has employed so many residents over the years. Beginning in the early 1970s, 14,000 construction workers put up the first two reactors on a 3,100-acre site. Today 800 employees—including engineers, control-room operators, lab technicians, and security officers—oversee the plant's operations 24/7. A pair of hump-topped containment buildings with 4-foot-thick concrete walls house two 355-ton underground reactor vessels: Vogtle Units 1 and 2. On-site inspectors from the Nuclear Regulatory Commission (NRC) conduct spot patrols and check monitoring instruments. Apart from a nuclear plant's characteristic power hum, Vogtle is surprisingly quiet. Next door it's a different story. Concrete-mixer trucks rumble across 800 acres of unpaved red Georgia clay as workers weld enormous components shipped from distant factories. A 60-story derrick, one of the tallest in the world, lifts the modules into place as they're completed. The two additional reactors under construction are supposed to combine with the operating units to make Southern's Plant Vogtle the most productive nuclear facility in the nation, ultimately generating electricity for 1 million customers. One doesn't hear much about the nuclear renaissance these days. A decade ago, when Southern started on Vogtle Units 3 and 4, nuclear was poised for a revival. It had backing not only from utility executives but also from climate activists feeling new affection for its low-carbon emission profile. With President Obama's Clean Power Plan—aiming for 32 percent carbon reduction by 2030 and officially enacted on Oct. 23—nuclear ought to be booming right about now. Stunting the renaissance before it got going were the 2008-09 recession, the 2011 Fukushima Daiichi disaster, and especially the proliferation of cheap natural gas. Nuclear, which provides 19 percent of U.S. electricity and two-thirds of the country's emission-free power, has arrived at a perilous crossroads. Four nuclear plants have shut down over the past several years because of recession-stifled demand and inexpensive gas. Eight or nine more are in danger of premature retirement for similar economic reasons. 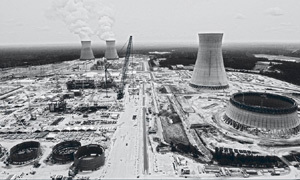 Vogtle Units 1 and 2, begun in 1971, weren't completed until 1989, more than a decade late. The original price tag was $900 million; the final bill came to $9 billion. After only seven years of operation, safety fears again stalled the industry following the full meltdown at Chernobyl. An explosion at the Ukrainian reactor led to the worst civilian atomic accident ever. Clouds of radioactive particles caused thousands of deaths among cleanup workers and left 1,000 square miles uninhabitable. While American plants such as Vogtle were better built and more safely operated than their Soviet counterparts, few Americans advocated for new nuclear facilities. Then, at the turn of the millennium, something unexpected happened: Environmentalists who'd manned antinuke campaigns began to shift their attention to climate change. Some green heroes such as James Hansen, the former NASA climatologist who sounded alarms about global warming, endorsed nuclear power as a necessary element of any workable carbon reduction strategy. “In the space of a few years the atmosphere changed dramatically, and we started to hear about this ‘renaissance,'?” says Joseph “Buzz” Miller, a chemical engineer who joined Southern's nuclear division just in time for Chernobyl in 1986. Southern hired Westinghouse Electric, which had designed a standardized reactor model approved by the NRC. Westinghouse marketed the AP1000 as more likely to stay within schedules and budgets because its main components can be built efficiently at specialized work yards, then shipped to a plant site and snapped together like an enormous steel-and-concrete Lego creation. “It's a much simpler design based on the decades of experience we didn't have in the 1970s and 1980s,” says Miller. 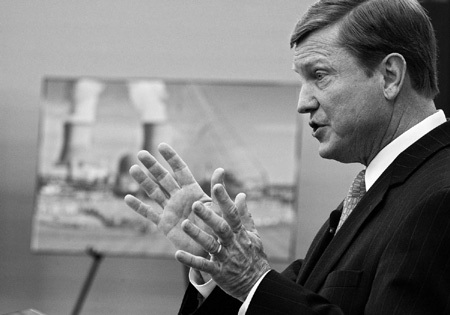 Deploying its formidable state-level lobbying force, Southern pushed Georgia politicians to enact an arrangement in 2009 called Construction Work in Progress. CWIP required customers to finance Vogtle 3 and 4 on a pay-as-you-go basis, rather than the traditional approach of a utility seeking full reimbursement after a nuke plant is completed—inevitably provoking sticker shock. In Washington, Obama folded support for Vogtle 3 and 4 into his broader campaign for climate legislation. The bill put a declining cap on carbon emissions while allowing cleaner utilities to trade pollution permits with dirtier rivals. At a news conference in February 2010, the president announced approval of $8.3 billion in loan guarantees for Southern. “Those who have long advocated for nuclear power, including many Republicans,” he said, “have to recognize that we will not achieve a big boost in nuclear capacity unless we also create a system of incentives to make clean energy profitable”—a reference to his “cap and trade” legislation. Southern accepted the loan guarantees but took an equivocal position on cap and trade. While the utility nominally supported some kind of climate bill, it stood shoulder to shoulder with the U.S. Chamber of Commerce, a corporate group that opposed the Obama plan as harmful to the economy. At the time, Southern still generated 56 percent of its electricity from burning coal, so on balance, cap and trade might have hurt its bottom line. Sometimes the company even seemed to be at cross-purposes. Earlier this year, environmentalists using the Freedom of Information Act disclosed documents showing that for the decade beginning in 2005, Southern had provided almost $470,000 to fund research by Wei-Hock “Willie” Soon, a Smithsonian-affiliated solar physicist who disputes widely accepted evidence of climate change. After the disclosure, Southern said it would stop funding Soon's work. In the spring of 2010, the Obama climate bill died in the Senate. Despite bailing on cap and trade, Southern continued to enjoy the Obama administration's loyalty. Then, in March 2011, an earthquake-generated tsunami swamped the inadequately protected coastal Fukushima nuke facility in Japan, causing diesel generators to fail. That cut power to pumps circulating coolant water, leading to a meltdown. Almost 16,000 people died as a result of the earthquake and tsunami. Radiation isn't thought to have killed anyone immediately, although some experts predict cancer rates will rise among first responders. 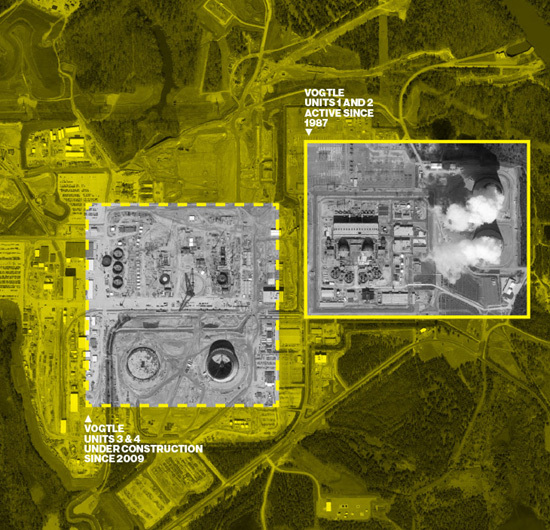 In all events, Fukushima raised fresh doubts about Southern's Vogtle expansion. Fanning, promoted to CEO only four months earlier, launched an all-out lobbying blitz. “I talked to everybody that would listen” at the White House and in Congress, he says. He argued that Vogtle didn't face coastal flooding or seismic dangers. Moreover, he said, the Westinghouse AP1000 represented a leap ahead of the technology at Fukushima. AP stands for “advanced passive,” a reference to an array of automatic safety devices designed to prevent meltdowns without human intervention. The main such mechanisms are enormous water reservoirs placed above and within the reactor vessel. If the cooling system fails, as it did at Fukushima, valves open, and gravity pulls the water down to cool the containment structure. As the water turns to steam, it rises, cools back to a liquid, and pours back down. That process is supposed to last up to three days, after which diesel-powered pumps kick in to add water from an exterior reservoir. Or that's the plan; one never knows about fail-safes until something serious fails. That bet hasn't paid off yet. The notion that standardized AP1000s would stay on time and within budget hasn't worked out. By late 2012, the $14 billion Vogtle project was almost $1 billion over budget and seven months behind the April 2016 target for Unit 3 to begin operation. In November of that year, litigation broke out between Southern and Westinghouse over the overruns. Southern blamed flaws in Westinghouse's plans; the contractor pointed to changes made in response to NRC revisions of the reactor shield building. The suits are still pending. Westinghouse declined to comment. By 2013, an engineer working for the Georgia Public Service Commission had identified persistent problems at the Chicago Bridge & Iron factory in Lake Charles, La., where components of the AP1000 were being built. Construction requirements for nuclear plants are more stringent than those of any other industry. Welds are meticulously checked via X-ray analysis and documented. Some of the work done in Lake Charles initially wasn't up to code and had to be redone. Miller concedes that many welders in Louisiana were “used to working on oil rigs.” He says these shortcomings have all been remedied, in part by farming out some of the fabrication work to factories as far away as Oregon and Japan. Other utilities have abandoned nuclear projects left and right. In the immediate wake of Fukushima, NRG Energy wrote off $500 million related to two reactors it canceled in Texas. The promise of federal loan guarantees wasn't enough to prevent Constellation Energy Group from dropping plans to expand at its Calvert Cliffs nuke plant in Maryland. 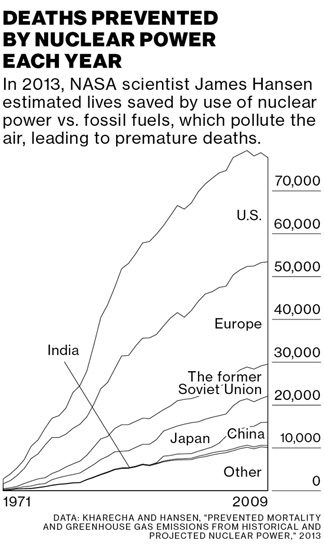 Turns out nuclear has been eclipsed by another scourge of environmentalists: the fracking revolution. Technological advances in freeing natural gas from subterranean rock formations—and the relatively modest price of building gas-fired power plants—make it difficult to justify the higher costs of building nuclear, especially in regions such as the Midwest and Northeast, where energy markets deregulated beginning in the 1990s. Nimble energy producers can sell gas-fired electricity into deregulated areas at prices much lower than that of nuclear or coal. Southern has the advantage of operating in a still-regulated market, where state public-service commissions effectively limit competition from cheap gas. In just the past several years, economic pressures in deregulated markets have caused the closure of Dominion Resources' Kewaunee nuke plant in Wisconsin, Entergy's Vermont Yankee plant, and three other nuclear facilities. An additional eight or nine of the nation's 99 nuclear units, several of them in Illinois and Ohio, are threatened with similar premature closures, according to Fitch, an estimate similar to one made recently by Moody's Investors Service. In mid-October, Entergy added the Pilgrim Nuclear Power Station in Plymouth, Mass., to the shutdown list, saying it would close no later than in mid-2019. “We tend to view the new rules as potentially the first bit of good news for the struggling nuclear industry,” Julien Dumoulin-Smith, an analyst for UBS, wrote in a research note after Obama announced the Clean Power Plan in August. But two weeks later, the pro-nuclear Third Way think tank produced a white paper warning that plant closures in Illinois, New Jersey, and Ohio could eclipse the new output in the South. “If America's nuclear plants begin retiring in droves, achieving the Clean Power Plan emissions reductions could be impossible,” Third Way said in the paper, titled When Nuclear Ends . Even with all the pessimism surrounding nuclear, one would assume that Southern is happy about the revised plan making it easier for Georgia to meet its emissions requirements. The carbon reduction goals, while facing Republican opposition and court challenges, make Southern look prescient in pressing ahead with the Vogtle expansion. Well, yes, that's called following federal law. What about publicly campaigning for the Clean Power Plan as a goad to new nuclear construction? No, Fanning says, Southern won't support the plan. He calls it federal “overreach.” Setting carbon reduction goals, he adds, should be left to the states rather than Washington bureaucrats. On Oct. 23, Southern's Georgia Power unit formally objected to the Obama plan in a federal court filing in Washington, saying the mandate would force it to retire 4,800 megawatts of fossil fuel-fired electricity. So even though Southern has been shifting away from coal for years—its current mix is 48 percent natural gas, 32 percent coal, 16 percent nuclear, and 4 percent hydro, solar, and wind combined—it doesn't want the EPA to dictate the pace of change. The echo of 2010, when the utility took federal loan guarantees from Obama but wouldn't get behind the president's cap-and-trade legislation, is unmistakable. Update: On October 27, Westinghouse, a unit of Toshiba, resolved its dispute with Southern in a settlement that included Westinghouse acquiring Chicago Bridge & Iron's nuclear business and taking over management of the Vogtle expansion. Paul Barrett is a Sr. feature writer Bloomberg Business Week. Author of Law of the Jungle (Crown, 2014) & Glock: The Rise of America's Gun (2012). Petroleumworld does not necessarily share these views.